Our names are Aiden and Deneen.&bsp; He is 20 and a freshman at the local University, and I am 26 and work at the University. We met at school.&bsp; I was invited to dinner at the campus dining hall and met Aiden.&bsp; There was an instant attraction on both of our ends, and we couldn't keep our eyes off of one another.&bsp; A few weeks went by before we started talking. I started spending all of my time with him in his dorm room, and he asked me out, but because I was just recently separated from my husband, I wasn't ready for a relationship just yet.&bsp; He told me that he would wait forever if that's what it took, but he only ended up having to wait 3 days! 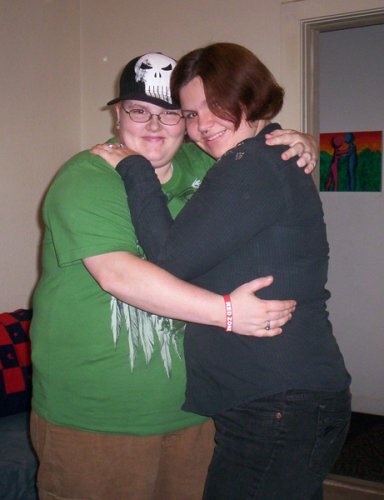 We are now engaged and plan on getting handfasted in May of 2010, and getting legally married after the gender change process is complete. We love each other no matter how much we weigh, but we've both always been more attracted to fat people, and more specifically, round fat bellies.